Kevin Lyons, Hayden-Lyons Roofs of Distinction, replies: I’d recommend that you install traditional half-round gutters in copper. The style is appropriate to your house, and you’ll never have to worry about the copper rusting. When the parts arrive, locate the high point of the gutter’s run—the farthest point from a single downspout or the midpoint between two. Then you can set the pitch, and the rest is all downhill. At the high point of the gutter’s run, hold a bracket and a section of gutter against the fascia, with the gutter’s outer lip just under the plane of the roof. Make a mark with a pencil for the bracket’s screw hole. Use a water level to make a matching mark at the downspout end. Measure down from that mark, ½ inch for every 10 feet of run, and mark the low point. Snap a chalk line between the high and low marks, and you have your pitch. Measure in from the end of the roof to the point directly above where you plan to attach each downspout. Typically, they run inboard of corner trim; how far depends on their bracket’s size. 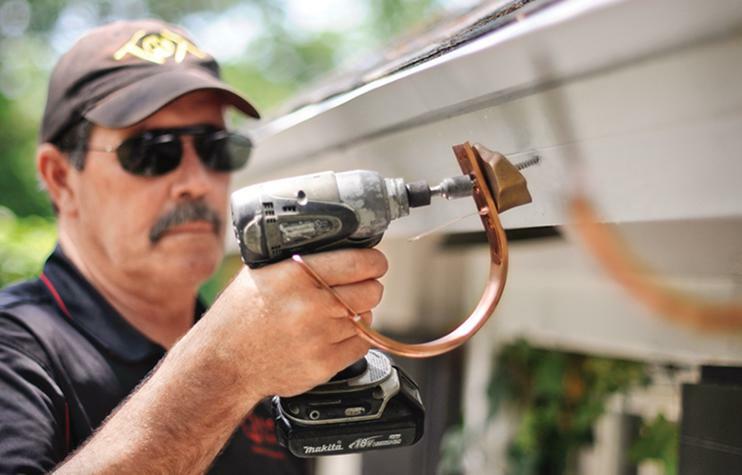 Transfer those measurements to the gutter, and cut the downspout holes with a hole saw or with metal shears, as shown.